(Jan. 14, 2019) -- As the UTSA family returns today for the start of spring semester classes, evidence of the 50th anniversary celebration will surround them online and off. 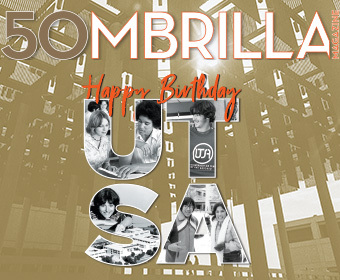 Today marks the official reveal of a new 50th anniversary website and the special 50th anniversary issue of Sombrilla Magazine. The university’s Main and Downtown Campuses are also draped in new signage heralding the way for a special celebration. For months a 50th anniversary committee of more than 30 faculty, staff and students from across the university, chaired by Marjie French, UTSA vice president for external relations and chief development officer, has worked to prepare for the yearlong celebration. Special 50th anniversary celebrations will take place at UTSA’s signature events throughout 2019 in addition to a unique birthday celebration on June 5, 2019, and a special alumni gala in September. At the same time, the UTSA Office of University Communications and Marketing, a team of 25 professionals in storytelling, digital media, design, advertising, photography, videography, social media and media relations, has been working with the UTSA Libraries and others across campus to piece together the university’s history and develop resources for the community-wide celebration. Their work, which represents thousands of hours over six weeks, including more than 200 hours in the University Archives, is culminated in discoveries, historic photos and videos, a timeline, memories, personal stories and a commemorative magazine on the UTSA 50 website. When the UCM team got to work, it began to look at individual moments and artifacts. For example, a misidentified item in the University Archives (the ceramic U-T-S-A letters in “The Story of UTSA in 50 Objects”) took on added dimension when UCM found a photograph that tied the letters to their actual place and time. Then a newspaper article serendipitously added more to the story. And ultimately, everything took the team downtown to Hemisfair Park to the building where the first UTSA president set up his office. They even found the holes on the building where the letters had once been screwed into place. “It was a pretty exciting moment to pull all of that together and have the history become tangible,” said Edwards. While in the archives, UCM learned that it truly was a group of remarkable people who had a dream about creating a public university in San Antonio back in the 1960s. Those leaders stayed focused and driven in their effort. “Without them, the idea, which had been floated for more than a decade, would have continued to get reworked, watered down and ultimately again and again fall flat,” said Edwards. Throughout 2019, UTSA’s 50th anniversary website will be updated with fresh pieces of history. 'Runners and their friends are encouraged to regularly visit the website to view new timeline additions, meet other Roadrunners, learn about upcoming anniversary celebrations and watch historical videos. UTSA students, faculty, staff and alumni are also encouraged to contribute to UTSA’s history by sending their stories, their photos and snaps of their memorabilia to 50years@utsa.edu and by sharing them on social media using the hashtag #UTSA50. “A single story from one member of the UTSA community might not seem significant but when put together with a series of stories studied holistically, the university’s history comes to life and it’s impressive,” said French. As UTSA draws closer to its official birthday on June 5, 2019, a number of special celebrations are planned. Check the 50th anniversary events calendar for more information.